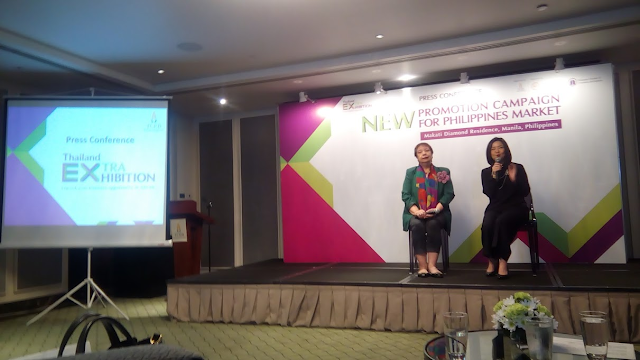 A few weeks ago I went to join a business forum led by Thailand Convention and Exhibition Bureau (TCEB) at the Makati Diamond Residences Hotel in Ayala Center, Makati City. They’re launching "Extra Exhibitions: Expand Business Opportunities in ASEAN" here in the Philippines because our country is considered as one of the priority countries for Thailand for trade. The Thailand government is widening its marketing efforts to promote exhibition platform as a gateway to do business with the ASEAN market. Comparing Thailand to our country when it comes to the product and services exhibition, we’re still way behind so I think this partnership is a win – win situation for both. This year TCEB has chosen Manila as the venue of the international launch of the promotional campaign which will serve as a business matching platform for Thai-registered public exhibition organizers (PEO) engaged in trade, energy, food and agriculture, health and wellness, and automotive and logistics to present and promote their trade shows with Philippine trade associations. There’s so many reasons why any business owners should take advantage of this opportunity. Bilateral trade between the two countries has reached more than $5 billion annually in recent years, with Thailand as the Philippines’ eighth largest trading partner in 2014. On the other hand, the Philippines is Thailand’s 6th largest trading partner in the ASEAN and the 18th biggest in the world. In that same visit, President Aquino noted that San Miguel Corp., Liwayway Food Industries Co. Ltd., Goldilocks, and Monde Nissin “have established their presence” in Thailand, while Thai enterprises have “likewise opened doors of opportunity” for Filipinos. At least eight PEOs will participate in the event which hopes to generate awareness of TCEB and promote exhibitions and extra exhibitions in Thailand, as well as, expand business opportunities in ASEAN with industry professionals. In 2013, the TCEB and the Philippine Chamber of Commerce and Industry (PCCI) and the Chamber of Commerce of the Philippine Islands (CCPI) signed a memorandum of agreement to establish long term strategic partnership in the Meetings, Incentives, Conference and Exhibitions (MICE) between the Philippines and the Kingdom of Thailand. Whether it is a startup or a big company, joining TCEB I believe this will definitely give the business an international exposure for more clients and markets to promote your products.